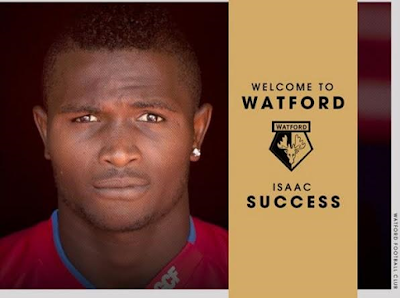 20-year-old Nigerian, Isaac Success, has completed a move to premiership side Watford for a club-record transfer fee of £12.5million. Isaac Success was sold by Spanish side Granada after scoring six goals in 30 La Liga games last season, earning Granada's Player of the Year award. He will team up with fellow Nigerian striker Odion Ighalo at the Hornets.